Made with 100% Cottons front and back. I have Pre washed before I made it, To ensure this sham stays nice after Washing. Machine washed cold water and dried flat, you can air fluff it after its dry and its still awesome! 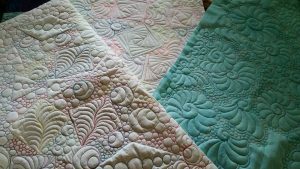 I also used Double Batting ( 1 layer 100 cotton, 1 layer X-loft Poly ) for added textile and “Puff” and to really show off the quilting.I used Decorative Threads, In variegated variety of colors. The color is Solid White Kona, with colored thread and a small multicolored trim.